We start with choice honey-cured hams specially prepared, spiral sliced and fire-glazed with our secret recipe of honey and imported spices. Selecting the size of your ham is important because you don't want to leave anyone out when it's dinner time. Take a look at our chart to help give you some guidelines when you are ready to place your order. 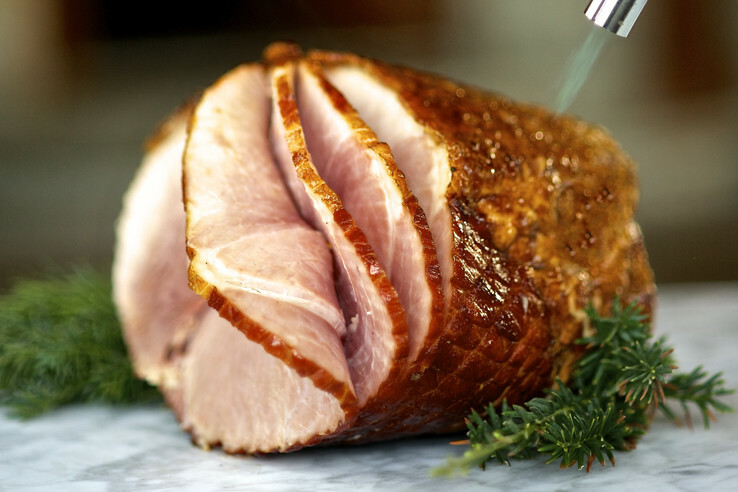 Serving Your Honey Kissed Ham is spiral-sliced around the bone for easy serving. The slices remain in place until you're ready to enjoy them. To remove the slices, run a small, sharp, pointed knife around the bone. If whole slices are larger than you wish, cut along the fat lines first. Warming Honey Kissed Hams are completely cooked and can be served cold, at room temperature or heated up depending on your preference. To warm ham, wrap loosely in foil and leave in a 325ºF oven for about an hour. More time may be required for whole hams. Be careful not to overheat the ham as this may dry the meat and impair the flavor. Saving Don't worry about having too much Honey Kissed Ham! Our special dry cured ham can be frozen up to 8 weeks. We suggest freezing leftovers immediately to retain original flavor. Place small portions of slices in tightly wrapped, dated packages for sandwiches, breakfasts, etc. Save that bone! If you like Ham and Beans, you'll love the flavor a Honey Kissed Ham bone adds to the pot! Hams should be eaten within a week for the best flavor. Allow 24-48 hours in the refrigerator for thawing.